Dare I say this but week 38 of pregnancy seems to have been slightly easier than weeks 36 and 37. No major heatwaves. No pre-eclampsia panics. Everything as good as it can be. In a way it is good that the biggest news in week 38 is that the dog has gone back after her holiday with us! In another way though, I am getting really impatient. I know I have at least a couple more weeks to go but I really want Bump to arrive. My urge to meet Bump isn’t helped by the fact that I am the last one due in my NCT group. We are already 4/8 born with another currently in labour as I write this. Of course, our time will come and I need to love the final stages of pregnancy and be patient. Yep I had no idea what partially engagement meant. So I googled it. This is what we are aiming for! Full engagement. Our week 38 check-up went without a hitch, I am still on weekly pre-eclampsia checks but there doesn’t seem to be any real concern over me or the baby. 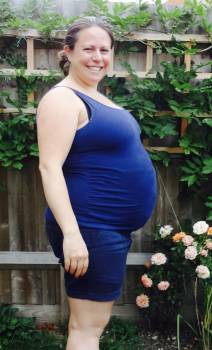 The GP said on Monday that the baby is still only partially engaged. Having said that, my appointment was over in record time and, when compared to previous checks, it didn’t feel like she really checked! I am sure though that she did and I am just looking for a reason why we aren’t fully engaged yet!! On the plus side, Bump must be dropping a bit because I have much less heartburn and I don’t get out of breath as easily. In fact my mother thinks Bump has definantely dropped although my husband and I can’t see it. The waddle has started! Yes you read that right, I am now in waddle mode. Walking takes ages. It has made me chuckle to myself when I get overtaken on my walks around town by people of all shapes, sizes and ages! My PGP (pelvic girdle pain) is also making a reappearance, this may be due to the baby increasing in weight or the baby moving downwards. Who knows. Now I would like to think that it is the latter but as I am still only partially engaged (no change in 3 weeks! ), I think that the baby must just be putting on weight. Oh and isn’t PGP in pregnancy bloody painful! Maternity leave does leave you with a lot of spare time. I had grand plans but if I am honest I am running out of energy! At the weekend we visited my parents, to return to the church we got married in for a special service. We also got to see my 3 eldest nieces (2 of whom have just moved back to the UK after 4 years in China and the other is home from school for good having just finished her A-Levels). My mum also came here to visit for the day, which was nice. We pottered around and did a little bit of wondering round the shops. I must admit to not really enjoying shopping at the moment. All these beautiful clothes but I can’t try them on. Of course, this is not helped by the weight of bump who slows me down and tires me quickly. I have, however, been baking!!! Anyone who knows me well will know that I LOVE to bake. I have so many gadgets and tools and I never normally have enough time to create anything. 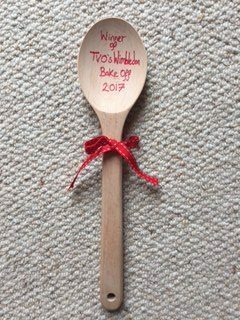 So when given the opportunity to bake something for a charity Wimbledon bake off at my husband’s work, I jumped at the chance! 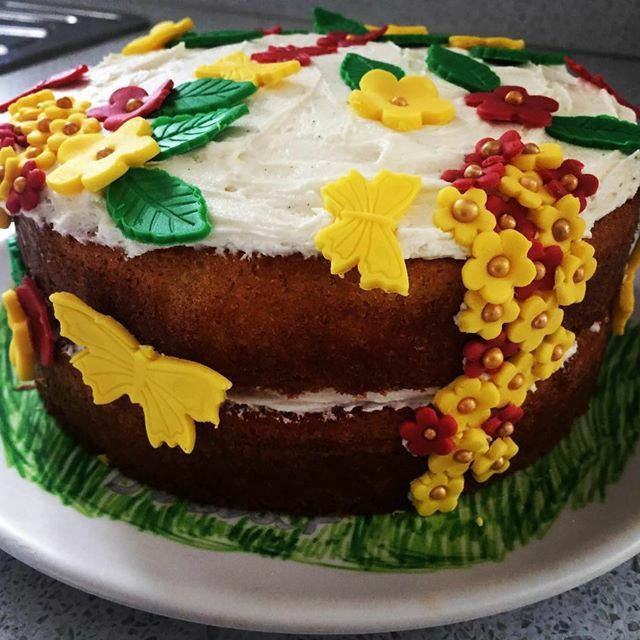 It was a team effort, my mum was here to help and made the decorations for the top and I baked and iced the cake. For my first cake in a long time, I was pretty pleased! A perk of being on maternity leave. I doubt I will have much time once Bump is born! Oh and I must thank one of my husband’s work colleagues for not allowing him to pass the cake off as his own!! Cheeky man! The lovely Carol delivering the news any pregnant mummy dreads…heatwave! Yes, according to Carol Kirkwood, the heatwave is coming back. That is right. 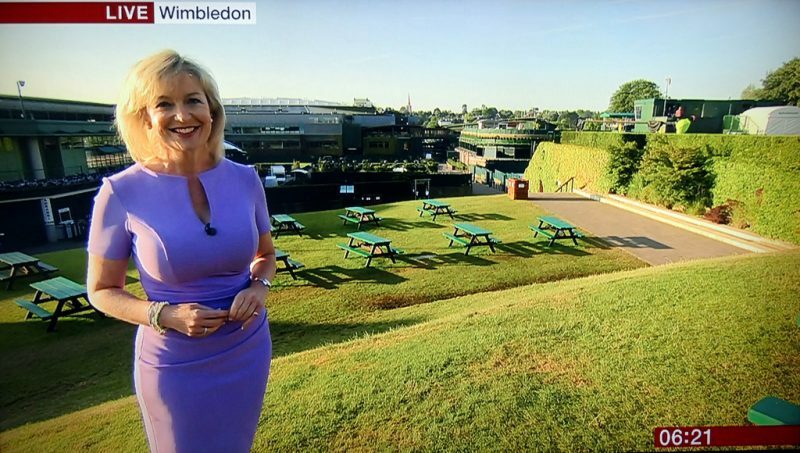 It is Wimbledon fortnight and there is a heatwave. Isn’t it meant to rain when Wimbledon fortnight is happening?!?! As you will remember if you are a regular reader (poor you! ), week 36 was pretty much unbearable due to the heat. I am now not working or commuting so I can sit on the sofa with the fan on and my feet up. Next up will be batch cooking/freezing so that I don’t have to think too hard about cooking much when the baby first arrives. However, I think anyone who wants to visit should be told to come with food! I feel like this week’s post has just been one big moan. I am sorry, I am not moaning. We are savouring every moment of this pregnancy and treasuring it don’t you worry. That is it for week 38. I will close by telling you we are having a “curry party” with an NCT couple on Friday. I wonder if it may start things off!!! Time will tell. How did you all pass the time before Bump arrived? Did you all get impatient or is that just me?